Aeonium arboreum ‘Zwartkop’s’ (Black Rose, Black Tree Aeoniums) distinctive feature is their beautiful dark purple, almost black foliage. Like all aeoniums, Aeonium arboreum ‘Zwartkop’ has striking rosettes that look like flowers and are made up of waxy leaves. 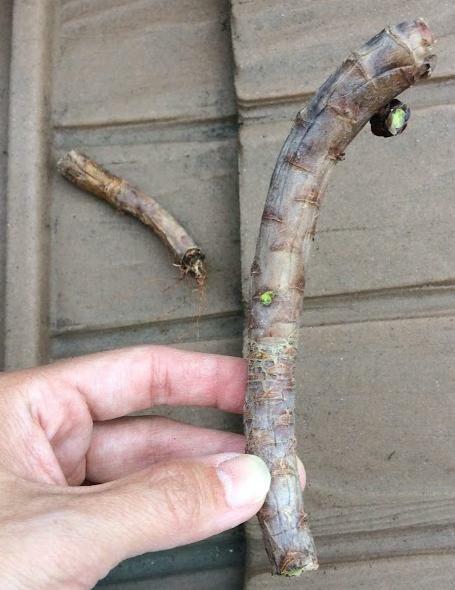 Stems can grow over 3 ft. (91cm) long. 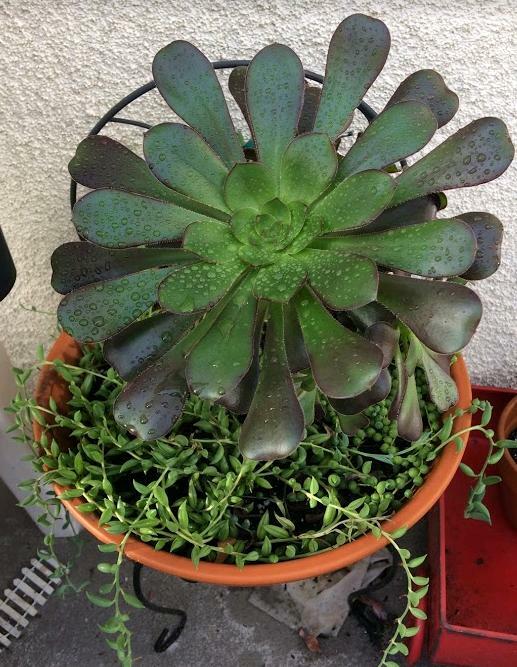 They really add contrast to your succulent garden because of their unique shape and color. To maintain its dark purple color, it needs plenty of sun. These are easy to grow and propagate once you learn the basics. Learn how to grow, care for and propagate these amazing plants right here. 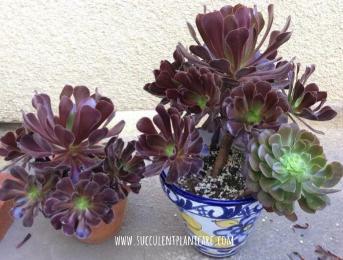 Are Aeonium arboreum ‘Zwartkop’ (Black Rose) Indoor or Outdoor Plants? These plants need plenty of light to thrive; therefore they do really well outdoors where they can get plenty of sunlight. They grow best outdoors until the temperature reaches freezing points. They are hardiest in USDA hardiness zones 9-12. When grown outdoors, they need to be protected from freezing temperatures. You can get away with growing them indoors but make sure to follow these indoor growing requirements. If kept indoors, the two most important things to consider is lighting and watering. Provide the brightest light possible. Pick the brightest window in the house to place your plant. If the plant does not receive enough light, it loses its dark coloring and leaves will turn to green. Soon you will notice the stems getting really long and elongating to seek out more light. This process is called etiolation. Etiolation produces poor growth and weakens the plant. If you notice this happening, you need to move the plant to a brighter location, or move the plant outdoors where it can get more light. You probably need to move the plant a few times to find the best spot for it. When growing indoors, provide some outdoor time for your Aeonium arboreum ‘Zwartkop’ by moving them outside during the warmer months to keep them happy. If moving the plant is not possible, you may consider using a grow light to supplement the plant’s sunlight requirements. Here’s some of my grow light recommendations. Ideally, the plant needs 5-6 hours of bright sunlight a day to thrive. Be careful not to overwater Aeonium arboreum ‘Zwartkop’ when grown indoors and make sure to provide a well draining potting mix. Low light and constantly wet soil will be detrimental to this plant and will send it to an early grave. For more on this topic, check out my post “Proper Lighting For Succulents Indoors” for more details and tips. Aeonium arboreum ‘Zwartkop’ (Black Rose) can tolerate partial shade to full sun. Provide as much sunlight as you can. If introducing the plant to more intense sun exposure, it is best to acclimate the plant so as not to shock it and burn its leaves. Slowly increase sun exposure until it can tolerate more intense heat or full sun. Mature plants are better at handling full sun than smaller, less established plants. A plant that has been acclimated to full sun can still experience sunburn or sun damage under extreme heat or during a heatwave. You can protect your plants from sunburn by moving them during a heatwave to a shaded area or placing them under a furniture, a tree or taller plants. Sunshades are also a great solution for those people in areas where the sun can really scorch the plants. Here are some of my sun protection recommendations. To read up more on this topic, I have an entire post on it here: “How Much Sunlight Do Succulents Need Outdoors”. Just like with any other succulents, Aeonium arboreum ‘Zwartkop’ (Black Rose) needs a well draining soil. I like to use cactus potting mix combined with perlite for added drainage. I eyeball it to about 2:1 solution of cactus mix and perlite. I like this combination because it is easy and it works well for my plants. I live in a very dry climate and this ratio works for me. For those that live in a more humid climate, you can increase the perlite to a 1:1 solution. You can also consider using a sandy soil. This can be achieved by mixing cactus mix or potting soil with coarse sand (about 2:1 ratio). Or you can use a combination of potting mix, coarse sand, perlite or pumice in equal parts (1:1:1 solution) for more drainage. To find out more about soil for succulents check out my post “Best Soil and Fertilizers for Succulents” for more details. If you need help finding these materials online, here are some of my recommendations for soil and soil amendments. Watering largely depends on the climate you live in. Watering schedule is determined by the season, the weather and humidity in your area. I live in a very dry climate so my watering schedule is adapted to the dry conditions of my environment. 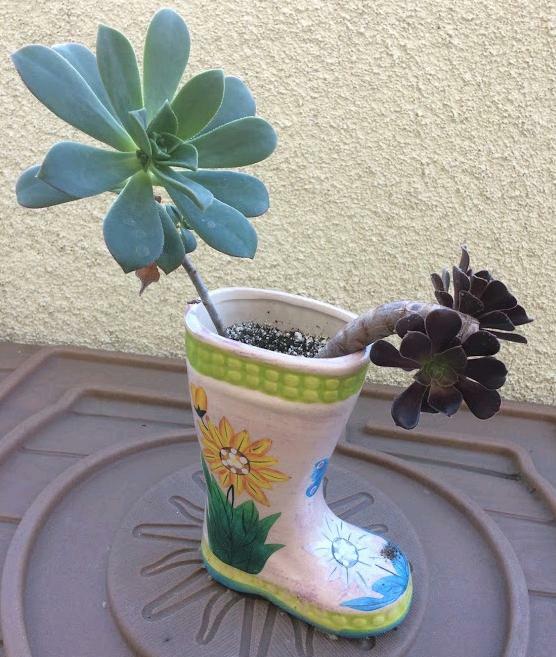 In the summer, during intense heat, I water my Aeonium arboreum ‘Zwartkop’ (Black Rose) every 7-10 days, giving them a good drink. I cut back on watering to about 10-14 days when the weather cools down. Keep in mind that I leave my plants outdoors so the soil tends to dry faster. If you live in a humid location or if you keep your plants indoors, you won’t need to water as much. During winter season, I mostly rely on rainwater and hold back on watering altogether because this is when we get a lot of rain in my area. But if we don’t get any rain at all during winter I water at least once every 2-3 weeks. Aeoniums in particular love the rain during winter. This is when they look their best and plump up and grow vigorously. Winter to early spring time are the growing seasons for these plants. One good way to check whether it’s time to water is to check the moisture of the soil. The top inch of the soil needs to feel dry before you can water again. If you are unsure how much and how often to water in the beginning, it’s always better to underwater and increase watering as needed. For further information on watering, here is my post on “How and When to Water Succulents and Cacti”. Along with watering habits, pay attention to your watering techniques. Water your plants thoroughly instead of misting. 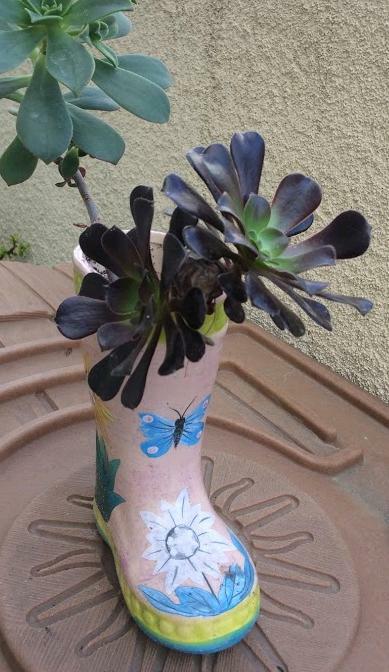 I give my Aeonium arboreum ‘Zwartkop’ (Black Rose) a good drink and then leave them alone until the next watering. If you are misting instead of watering, the plant will not get enough water because the water may not reach the roots of the plant where the water needs to go to be absorbed. 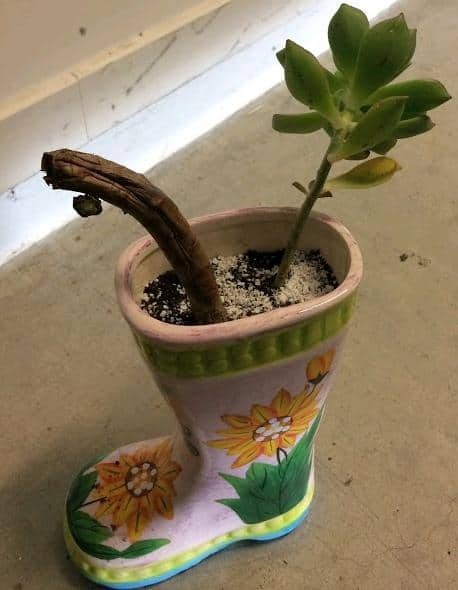 Don’t be afraid to give the plant a good drink of water and let the water reach the roots of the plant so it can be absorbed from the root up. If you need further help with watering techniques, consider using tools like hygrometers or moisture meters to check for moisture in the soil and air. These tools are pretty affordable and can come in handy when needed. Visit my resource page to check which moisture meters I recommend. Aeonium arboreum ‘Zwartkop’ (Black Rose) after rain. Aeoniums love the rain and plump up. This was also during the winter season when aeoniums are actively growing. 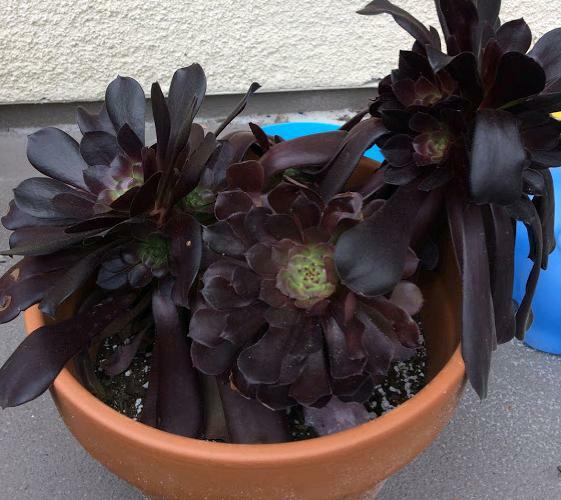 Aeonium arboreum ‘Zwartkop’ (Black Rose) lose their dark purple color when placed in the shade. Notice the leaves are greener and the dark colors less intense. This was taken after weeks of rainy and cloudy weather. While Aeonium arboreum ‘Zwartkop’ (Black Rose) can tolerate mild frost and freezing temperatures, it can only do so for short periods of time. Prolonged exposure to freezing temperatures is not advisable and may damage your plant permanently. I live in Northern California where winters are mild. We do get some freezing temperatures here but it’s nothing compared to other areas with severe winters. I leave my Aeonium arboreum ‘Zwartkop’ outdoors all year long and they do just fine during the winter season when it is the wettest time of the year. But for those with severe winters, you need to protect your plant from frost or freezing temperatures. The best way to protect them from freezing temperatures is to move them indoors. The only way you can do this is if they are planted in containers. If they are planted in the ground you can protect them using frost cloths or frost covers and green houses. Here are some of my frost protection recommendations. The best way to propagate an Aeonium arboreum ‘Zwartkop’ is by stem cuttings. These plants do not propagate from leaves but propagating from stem cuttings is easy enough and almost guarantees success. Take a stem cutting. Let it dry for a day or two. If you live in a humid location you may need more than two days depending on the thickness of the stem. The thicker the stem, the longer it takes to dry. Dip in rooting hormone (optional step). I tend to skip this part but some people like to take this extra step to help speed up the rooting and propagation process. Once the stems are dry and have sealed or calloused, you can stick them in a well draining potting soil. After a few weeks, roots should have developed. Another few weeks and the stem cuttings should be rooted in the soil. You can check if the plant has rooted by tugging at it. If the plant does not slide out of the soil easily then roots have formed and you have yourself and new plant that will soon grow, branch out and produce more new aeoniums. Keep away from direct sunlight until fully rooted. Slowly increase the amount of light as the plant matures. Aeonium arboreum ‘Zwartkop’ (Black Rose) propagate very easily from stem cuttings. Just stick them in soil and they will root in a few weeks. Soon you’ll have yourself more new plants growing everywhere. This stem broke off and I was able to propagate it by sticking it in soil. It is now growing vigorously in the same pot. This plant was grown from a broken stem (see above). It is doing really well to this day and may need to be repotted to a bigger pot soon because it is outgrowing this one. Just like most other aeoniums, Aeonium arboreum ‘Zwartkop’ are monocarpic plants so they die after they flower. Unfortunately, once you see it shooting out a bloom, there really isn’t much you can do to stop the process so you might as well enjoy it. The good thing is, they usually don’t produce flowers until they have produced plenty of offshoots and baby plants. These offshoots will live on and continue producing offshoots of their own after the mother plant flowers and dies. Aeonium arboreum ‘Zwartkop’ produce elaborate flowers that protrude out from the center of the rosette. These flowers are showy and are not hard to miss. They are usually yellow in color and contrast well with the dark foliage of the plant. It is normal for aeoniums to drop old leaves as new ones develop. These leaves will appear wilted, dried up, brown and droopy. The bottom leaves dry up first as new growth appears from the top. You can simply pull the old bottom leaves out or let them fall out on their own. But if leaves are dropping at an alarming rate, then it is usually a sign that there is a problem with the plant. The most common problem is usually with watering. Aeonium leaves can drop from underwatering and overwatering. The plant sheds its leaves to conserve water and energy when it is underwatered. To correct this problem, give it a good drink and the plant should perk up almost immediately, within a day or so. 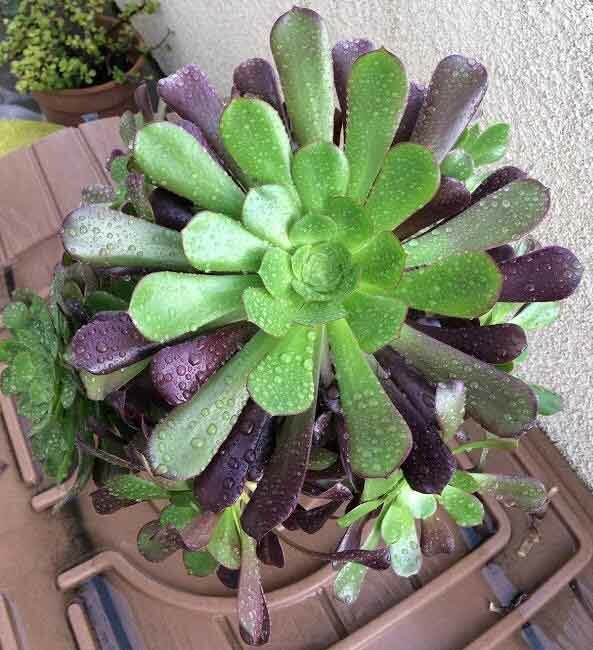 An overwatered aeonium will also shed its leaves from too much water. An overwatered plant will drop its leaves at the slightest touch. The stem can also appear soggy and the plant will have an overall ‘sick’ appearance. If the soil is kept constantly wet, root rot will set in. To prevent this, remove the plant from the wet soil and let it dry out for a few days. Replant in a well draining potting mix. Remove any parts that have rotted. Save the part of the stem that has not succumbed to rot. The stem should feel firm and not mushy. You will be able to root the stem and propagate it to start a new plant. Aeonium arboreum ‘Zwartkop’ also shed their leaves when they go through dormancy or when they are under stress. They become dormant during the summer months or extreme heat. This is when the plant drops most of its lower leaves, starts to droop and appear like its dying. The stems will appear bare and scraggly. 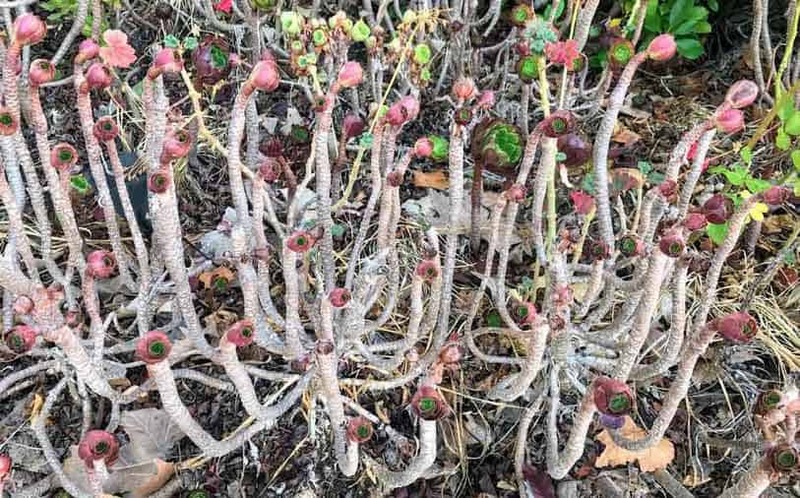 Aeonium dormancy is temporary and they perk back up when the weather cools down and they start their growing season again. Do not expect too much activity or growth from aeoniums during dormancy. Leave the plant alone at this time and avoid stressing the plant out by taking stem cuttings, repotting or propagating the plant. You may continue to water the plant as you normally would. Some people refrain from watering their aeoniums altogether during dormancy. I still water mines to prevent them from completely drying out because I live in a very dry climate. Refrain from overwatering and fertilizing during dormancy. Do not panic and overcompensate by overwatering and fertilizing as this would harm the plant more. Ants-Wherever mealybugs or aphids are, chances are you will find ants. Ants are not pests but when you see them all over your aeonium, you need to take a closer look because it is a sure sign that you have other pests hiding in your plants. That’s because ants farm these pests and use them as a food source. Aphids and mealybugs secrete honeydew or these sugary substance that ants love. Ants protect these pests and can transport them from one plant to another. My Aeonium arboreum ‘Zwartkop’ were hit hard by these garden pests two years ago. Thankfully they are such resilient plants and bounced back after treatment. I got rid of them naturally without resulting to using harsh chemicals, but it took a lot of hard work. They are doing well these days and have remained bug free. 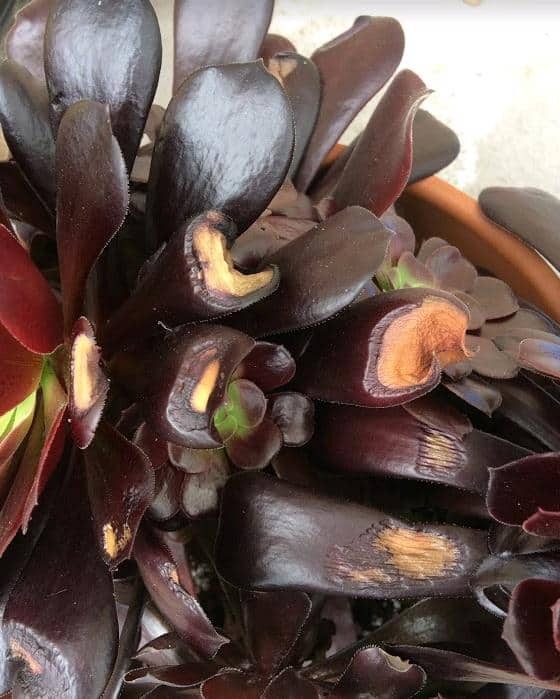 To read how I treated my Aeonium arboreum ‘Zwartkop’ from pests, read my post “How to Treat For Ants, Mealybugs, Aphids on Succulents”. 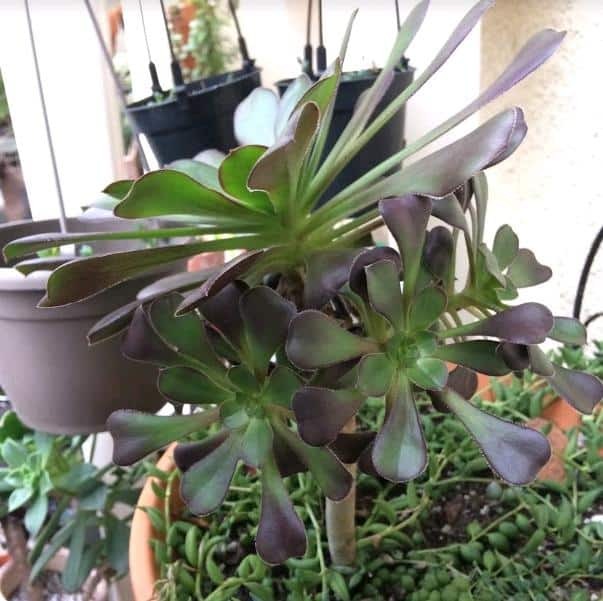 Are Aeonium arboreum ‘Zwartkop’ Poisonous to Dogs, Cats or Pets? 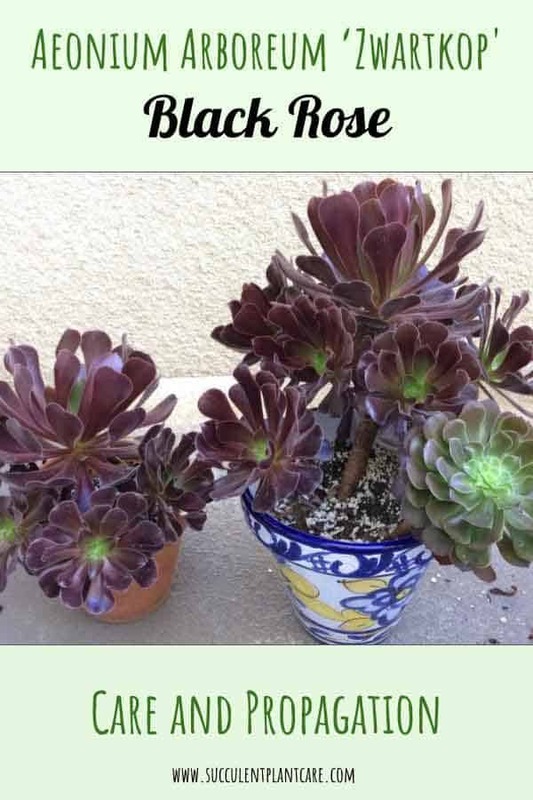 The ASPCA website does not list Aeonium arboreum ‘Zwartkop’ as toxic to pets. To learn more about toxic plants, visit ASPCA’s website. If you suspect poisoning, contact your local veterinarian immediately or the ASPCA Animal Poison Control Center at 888-426-4435. Aeonium arboreum ‘Zwartkop’ (Black Rose) are truly exceptional plants that will add interest and beauty to your garden space. These are hardy, resilient plants and will reward you with offshoots for years to come. Check out my Resource Page to get some ideas where you can buy succulents online. Pin this to save for yourself or share with others!